Heat oven to 375ºF. Grease or spray 32 miniature muffin cups. In medium bowl, stir cookie mix, flour, butter and egg until dough forms. Roll dough into 32 (1 1/4-inch) balls; roll in coloured sugar. Place balls in muffin cups. Bake 12 to 15 minutes or until set and edges are light golden brown. Cool in pan 10 minutes; remove to cooling racks. Add coconut to a large resealable food-storage plastic bag. Add 3 to 4 drops food colour and shake until well blended. It may be necessary to add 1 to 2 teaspoons water to help disperse the colour evenly or additional food colour until desired colour is reached. Frost top of each cookie. 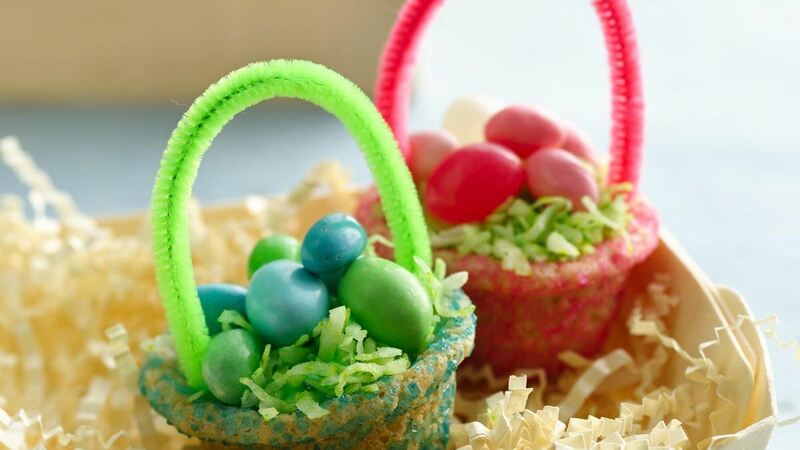 Decorate with coloured coconut and jelly beans. Tie a small ribbon bow on 5-inch piece of pipe cleaner; insert into each basket for handle. Success : For even baking, make sure cookie dough balls are of the same size.